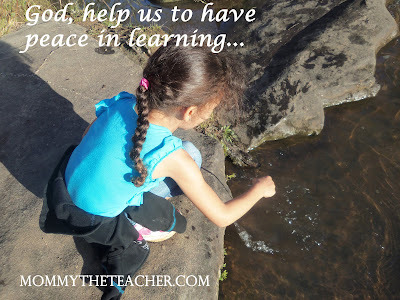 Peace in learning...that's what my four year old prayed and asked God for over a month ago when it was brought to my attention that my method of getting the kids to behave was doing a lot more harm than good. would scurry in a hurry or shuffle nervously at the sound of my voice. Whether I was walking in the room or calling from another room of the house, she'd do this. My children are 7 and 4 and I'd been yelling so much out of frustration and impatience that it was becoming a very bad habit. After about 4-7 days of seeing this, I realized that what I saw in her was 'fear'. I could not take that. I gathered them both together and asked if they were afraid. The youngest said, "yes because the last time you were so upset with us." At that point, we talked and talked. I told them that there shouldn't be any fear in our home and that we are a family and that we love each other. I told them that discipline is for learning and is a must, but fear is not apart of the equation. So I grabbed their little hands and asked them to pray with me to ask God to help mommy to communicate with them better so that there is no fear in our home and family. After I prayed (in an earnest and nearly desperate tone) not feeling any closure or complete-ness to the matter, I asked the youngest girl to pray (I rarely do this). We grabbed hands again, the three of us and she prayed one sentence that went like this: "God I ask you to help us to have peace in learning. Amen." As soon as she was done, I knew that was it! I don't know how that sounds to you, but to me, it was music. It was as if the heavens opened up and the heavenly chorus began to sang hallelujah! I choked up some and looked into Chelsea's deep set dark eyes and said, "that's it Chelsea, that is it." "God answered our prayer through your prayer." She looked proud, elated, and a little confused all at the same time. Here it is though. For us, we needed peace. It's kind of like The Sword in the Stone. I thought, with my much yelling and muscle strength, I could get the kids to behave and do what's right. However, the only fruit that I saw was fear manifesting in my girls' hearts. What I actually needed was to approach disciplining them from a peaceful perspective using far less muscle, so that they'd have peace even while being disciplined which simply means to teach. That's part of what a child needs. A peaceful atmosphere to learn and grown in. Now, my husband and I believe in consequences for disobedience. So this is not your "talk to them and reason with them" speech although, we do do that. This was just what I believe God used to get through to me that yelling, in my home, was not necessary and not the way for me to discipline the girls. Here's the take away of this post if that's what your are here for. Talk to the kids about discipline and how your yelling is not the best response but that disobedience is also unacceptable and that discipline is a must no matter what. Then, PRAY. Pray and ask God to help you. But don't do it alone, pull your kids in on it no matter their ages. They will see your sincerity in seeking God on this issue and realize that you are serious about making changes in this area. They will see how important it is to you. This will be just one more way for them to be eye-witnesses of your love for them. What do you do when the heat is on? How do you handle these high pressure moments in your day with the kids? Leave a comment and feel free to leave a link so we can find your blog and comment as well. Steph --I would love it if you liked me on facebook! This post touched my heart and soul, because it was like looking into a mirror. I am the grandmother homeschooling the 5 year old who is afraid, and my children were when they were growing up as well, I should have known you then but then you would have been a child, so thank you for this, it was a real reminder of what I already knew and have been trying to work on. Anyway, I was so upset with them about this and they KNEW it, but I did not yell. I spoke strongly, I punished them, but no yelling and neither of the girls are exhibiting any fear in the house now. I pray that you find the way of disciplining that works for you and your grand. Thanks for reading and commenting and liking me on facebook! What an amazing gift to your children to admit that you had been wrong in your method. A willingness to apologize and admit imperfection alone taught more lessons than you probably realized! You know...my parents did not approach parenting me like this, so it is truly uncharted territory as it relates to apologizing and such; but I believe it is what is best for us and for the type of girls that we have. This is what I love about being home with my children - when opportunities for growth and learning like this come up. Awesome post! I feel like things have a little like this here too. Your girls are the same age as mine. Thanks for your reminder to pray! What kind of consequences do you use with your girls? Hi Stephanie! Love the name! Our girls have to stand in the corner for minor transgressions (I use the term playfully) only for a couple of minutes this is more or less for effect. Just to let them know that this is out of bounds but not too serious. They by no means do things that they have to stand in the corner everyday. Which is probably why it serves mostly as a reminder that what you did or said is not o.k. They've had to write sentences for more serious infractions: things like having to be told over and over again to do something and they still just did not do it...time to bring out the sentences. My four year old has had to write 5 sentences before and this was a HUGE deal for her. Trying to sit still long enough and stay focused on a mundane task was HUGE consequence for her. My oldest has had to write as many as 30 before. Then for the lying, which is among the ULTIMATE no-nos; holding the arms out. Now, my oldest has never had to do this. She's a very honest and confident kind of kid as far as her actions go and owning up to them. I guess you could say she makes good decisions in a general sense of speaking. The youngest though, she understood lying as a way to escape after having done something wrong (like most people I guess) So she's had to hold her arms out on 3 or 4 occasions. Let me tell you, her first 2 times of having to do that were sort of back to back (a couple of days apart) She caught on QUICKLY that lying was not o.k. and there were weeks between her second and third infraction and months between the 3rd and 4th and the 4th time, was such a non-sense kind of lie that she didn't have to hold them up for long (but I had to be consistent). The arms thing is painful and it brings serious tears and it hurt me the first time but I couldn't short change her as her parent and lead her to believe that it's o.k. to just say things that aren't true, so in my mind there was no option. She ended her punishment by saying very emotionally and emphatically, "I'm never ever telling another lie!" And I'm thinking, yep that's kind of the point. One time, we had to take Friday Family Fun Night away b/c they were digging in the front yard after being told very thoroughly and plainly and emphatically just 3 days earlier not to do that (we have an HOA) by BOTH parents!! That was HARD (taking away FFFN)...but we feel as parents that some things have to hurt in order for them to remember. As for spanking, which I know is the biggie here, we've done it before..a swat or two on the behind for disrespect (this is when they were younger to set the tone of what the interactions between us and them should be like). We've done it before for issues of safety...say like we're in a parking lot with moving cars and they've been told not to run, well when they did run anyway (out of excitement or due to forgetting) a swat on the behind was, in our minds, necessary because we rather your behind hurt for a minute or two by our hand than your entire body from a moving vehicle. I just felt like it was worth the backlash of an on-looking, non-spanking parent. Which, I've never personally gotten that sort of backlash from anyone. We honestly do have very well behaved kids who don't have to be disciplined as described above everyday or every week. We do A LOT of talking to them which is why we feel justified in our disciplining measures. We are very explanatory in our conversations with them about right and wrong which I believe is how yelling starts. When you've passed the point of talking about the same thing over and over again but it hasn't landed on your radar as the parent that they are simply not doing what you've explained over and over; and so you (I mean me) are supremely frustrated and you yell instead of discipline. Wow! this is the longest comment EVER, but I enjoyed writing it and I hope it sheds some light on what we do in our home and I'd love to continue to the conversation if you have anything to add that I can take away. Thanks for stopping by my blog and reading! Oh this is a big one for me. I am planning on reading "Unglued" this summer as a way to focus my heart on this area that I need to work on. I love the idea of talking to my girls about it and living honestly in front of them! I appreciate your honesty and willingness to talk about this with your children. I'm a grandma now, but I remember those stages in mommyhood when I had a problem with yelling at my children. What an excellent way to deal with it. Thanks for linking to T.G.I.F. I'm a new follower on FB, Twitter and Pinterest. Are You Participating in Screen Free Week?